Mississippi’s defense is statistically among the worst in the nation while the offense has been inconsistent. Now the Rebels are fighting a new problem: Undisciplined play. 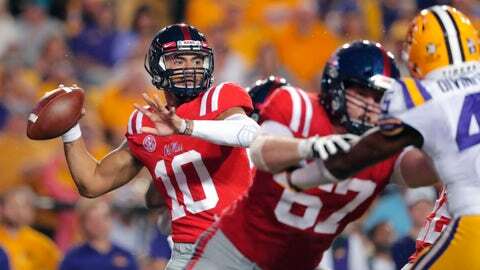 Ole Miss was called for 17 penalties for 167 yards in the team’s 45-16 loss to No. 5 LSU last weekend . It certainly wasn’t the only reason the Rebels lost to the Tigers, but the undisciplined play is something that second-year coach Matt Luke said his team can control and must fix. Ole Miss (3-2) is hoping to correct its penalty problem and gain some momentum on Saturday when it hosts Louisiana-Monroe (2-3). It’s the Rebels’ final chance to improve against a nonconference opponent. They have six straight games against SEC foes to end the season, starting with Arkansas on Oct. 13. The most interesting development for this weekend’s game might be off the field. There were huge swaths of empty seats for the Ole Miss-Kent State game on Sept. 22 — even though the school announced a crowd of 50,417 — and there could be a lot of no-shows this Saturday, especially after the lopsided loss to LSU. Louisiana-Monroe comes into the game on a three-game losing streak. The Warhawks have already played one game against an SEC opponent this season, losing 48-10 to Texas A&M on Sept. 15. Ole Miss is 3-0 against nonconference competition this year and is averaging more than 52 points per game in wins over Texas Tech, Southern Illinois and Kent State. Thanks to those games, senior quarterback Jordan Ta’amu leads the SEC with 1,537 yards passing. Scottie Phillips is 10th nationally with 563 yards rushing. The Ole Miss secondary got more bad news this week after it was announced that safety C.J. Moore had torn a pectoral muscle and is out indefinitely. The Rebels have already had to fill holes in the secondary after season-ending injuries to Jaylon Jones and Montrell Custis. Luke said he would move Armani Linton from running back to the secondary to give the Rebels added depth. Ole Miss has a 25-5 record in their past 30 nonconference games and hasn’t lost at home against a nonconference opponent since 2014. The Rebels have a 31-1-2 record against current teams in the Sun Belt Conference and a 3-0 record against the Warhawks. Louisiana-Monroe has a lot of experience playing against SEC opponents, even though it usually hasn’t resulted in wins. The Warhawks have a 4-47-1 record all-time against members of the SEC, with the four wins coming against Alabama, Arkansas, Mississippi State and Kentucky. The latest win was a 34-31 win in overtime over Arkansas in 2012. Louisiana-Monroe started the season with two wins, including an impressive 21-20 road victory over Southern Miss on Sept. 8. But the Warhawks have lost three straight over the past two weeks, including a 46-14 setback to Georgia State last weekend. Quarterback Caleb Evans has thrown for 1,192 yards, seven touchdowns and six interceptions.